Among shonen anime My Hero Academia is quickly reaching heights reserved for only the most illustrious of the genre. 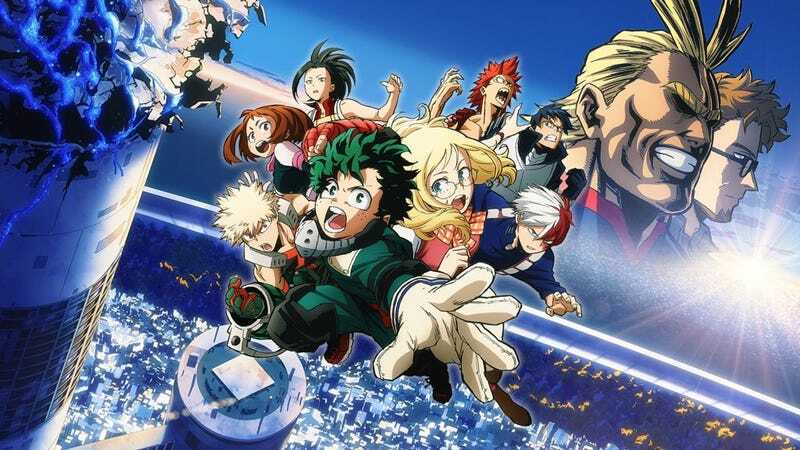 As such with this popularity comes the inevitable film adaptation, however unlike other cinematic adaptations My Hero Academia: Two Heroes manages to capture the highs that make the series so popular. For the most part that is. Shonen film adaptations tend to be a mixed bag, even the most die-hard of fans acknowledge these films can be pretty terrible. As any Dragon Ball fan what they thought of Bio-Broly and you will see what I mean. Which is why it is refreshing to say that My Hero Academia: Two Heroes subverts this trend in a big way. From start to finish Two Heroes does not feel like an intrusive side story or a pointless filler arc. It actively fills in gaps in the series backstory cementing its place in the anime canon, a welcome change from many other types of this adaptation. Furthermore, it makes good use of its unusually long run time by presenting a well formed and cohesive story, if nothing too inventive. That being said, the film is not perfect, far from it. It has a few flaws mostly stemming from the medium. It wastes precious time setting up the premise, characters, and even basic interpersonal relationship dynamics any fan would know by now. Thankfully, this exposition is largely over within the first twenty-five minutes of the film. The rest of the film is a quite enjoyable action adventure romp that is surprisingly reminiscent of Die Hard. Continuing the series trend of invoking North American style. In many ways, Two Heroes felt less like an anime film than a 1980's action film with superheroes. The light feel of the films early section blended well with the series humour and characterization - most notably with All Might ably voiced by Chris Sabat just having a blast. While other characters personality traits often used for one gag or the other. Over time the film grew darker as it mimicked earlier story arcs of the anime. Further emphasizing how naturally the film could fit in the anime continuity. Sadly one of My Hero Academia’s greatest strengths, its characters, are underutilized in the film. Due to the constrained runtime, the large cast is largely set aside focusing on only four or five key characters. While other characters do get some great moments in the film, they are largely reserved for those that top popularity polls and come equipped with flashy quirks that are visually appealing. Luckily, when those great moments come along do they ever shine. Two Heroes animation is top notch, easily rivaling Deku vs. Todoroki or The United States of Smash. The entire third act of the film is pure spectacle and it is just fun, if simplistic and similar to other anime films. For fans of the series though, it is a real treat. Besides the fighting; once the film gets rolling characters that interact well continue to do so. One stand out comedy duo being Bakugo and Kirashima who’s friendship and chemistry in the film is even more apparent than in the anime. Of course, the biggest issues with the film is one that plagues every adaptation of a currently running series. The total lack of stakes and the ability to affect the status quo. If you go in expecting to see change, you will be disappointed. Two Heroes is a static affair, constrained by its format. It is a limited adventure to have fun with and then leave, with no real changes being present. This includes the two prominent anime original characters the Shields who provide welcome All Might background information, they still suffer from the filler problem of being inconsequential once the credits roll. Interestingly Two Heroes is aware of this and manages a feat which is rather unique. It serves as a beautiful encore to an event that has not happened yet in its time frame and a swan song for one of its best characters. While largely irrelevant for fans of the series the film will be welcome. All said, I really enjoyed My Hero Academia: Two Heroes much more the similarly structured Sword Art Online: Ordinal Scale and the most recent Dragon Ball film. It manages to capture the spirit of the original and condenses it into a very enjoyable, exciting, and visually pleasing treat. For fans of the series, it is a must watch and I encourage anyone who can get tickets to check it out. The film is PLUS ULTRA!